Constellation Cassiopeia the Queen, or Seated Woman, is a northern constellation which lies between constellation Perseus, constellation Andromeda, and constellation Cepheus. It spans 25 degrees of the Zodiac in the Sign of Taurus, and contains 8 named fixed stars. Cassiopeia, the the wife of Cepheus and mother of Andromeda, was taken into heaven in consideration of the deeds of Perseus (see Andromeda). She is said to have boasted that not only Andromeda but she herself was fairer than the Nereids, and for that reason she was bound to her chair and condemned to circle the pole head downwards as a lesson in humility. Cassiopeia, or Cassiope more correctly Cassiepeia, although variously written, is one of the oldest and popularly best known of our constellations, and her throne, “the shinie Casseiopeia’s chair” of Spenser’s Faerie Queen, is a familiar object to the most youthful observer. It also is known as the Celestial W when below the pole, and the Celestial M when above it. and Cassiepia, her face upturned to witness the sacrifice she caused… Cassiope will produce goldsmiths who can turn their work into a thousand different shapes, endow the precious substance with yet greater value, and add thereto the vivid hue of Jewels. From Cassiope come the gifts of Augustus which gleam in the temples he consecrated, where the blaze of gold rivals the sun’s brightness and the fires of gems flash forth light out of shadow. From Cassiope come the memorials of Pompey’s triumph of old and the trophies which bear the features of Mithridates: they remain to this very day, spoils undimmed by the passage of time, their sparkle as fresh as ever. ULUGH BEY says its Arabic name is El Seder, which means the freed. In the Denderah Zodiac her name is Set, which means set, set up as Queen. 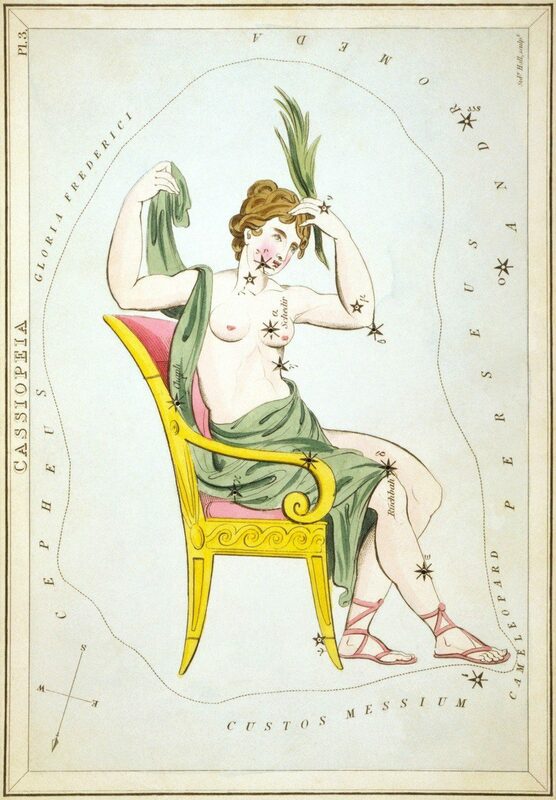 ALBUMAZER says this constellation was anciently called “the daughter of splendour.” This appears to be the meaning of the word Cassiopeia, the enthroned, the beautiful. The Arabic name is Ruchba, the enthroned This is also the meaning of its Chaldee name, Dat al cursa. There are 55 stars in this constellation, of which five are of the 3rd magnitude, five of the 4th, etc. This beautiful constellation passes vertically over Great Britain every day, and is easily distinguished by its five brightest stars, forming an irregular “W.” This brilliant constellation contains one binary star, a triple star, a double star, a quadruple star, and a large number of nebulae… The brightest star, α (in the left breast), is named Schedir (Hebrew), which means the freed. The next, β (in the top of the chair), likewise bears a Hebrew name Caph, which means the branch; it is evidently given on account of the branch of victory which she bears in her hand. She is indeed highly exalted, and making herself ready. Her hands, no longer bound, are engaged in this happy work. With her right hand she is arranging her robes, while with her left she is adorning her hair. She is seated upon the Arctic circle, and close by the side of Cepheus, the King. 3. Star Names: Their Lore and Meaning, Richard H. Allen, 1889, p.142-145. 4. Astronomica, Manilius, 1st century AD, book 1, p.33, book 5, p.343. 5. The Witness of the Stars, E. W. Bullinger, 25. 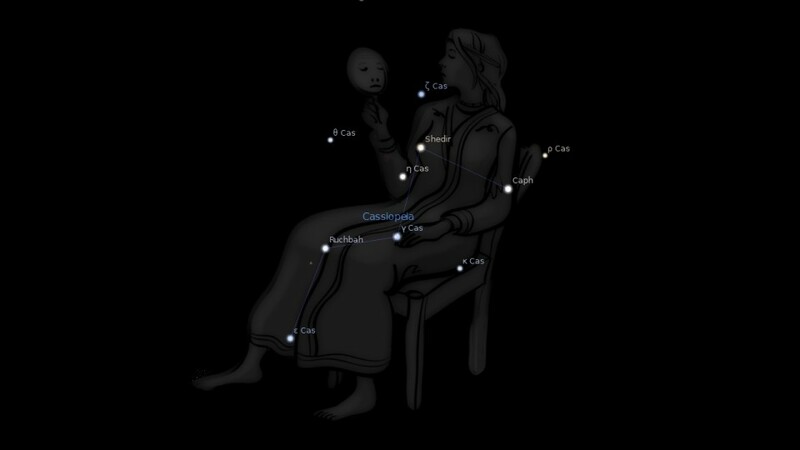 Cassiopeia (the Enthroned Woman).